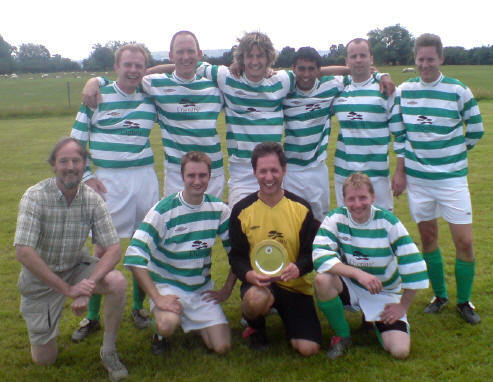 North Cheltenham Churches were one of the 5 teams that showed up for the 9-a-side tournament held at Bishops Cleeve FC and confidence was high after many Wednesday night training sessions! The matches were 20 minutes long on full size pitches! The only worry was that with 12 players allowed we only had 9 which meant no rests! After winning the last 5-a-side competition with ease we were a bit wary of the Ecclesiastical side but we couldn't have started better! After 5 minutes and a good flick on our first goal was scored by the reliable Andrew Murton making it 1-0 to NCC! The match then started to even out with chances at both ends but another quick NCC break set up Mike who slotted the ball past the keeper from the right hand side of the penalty area. 2-0 to NCC. With 5 minutes to go Ecclesiastical looks down and out but after a scrappy affair in the NCC area the ball slipped past Tim making it 2-1. In the last minute of the game the Ecclesiastical captain called for the ball in the box and volleyed it into the back of the net making the final score 2-2. This was not a bad result for us and we were happy with our performance overall. Our second game was very close with chances at both ends resulting in good defending. The majority of the possession went to NCC but the ball just didn't seem to want go the right sides of the posts! The only goal of the game went to Tewkesbury after a shot which looked covered took a nasty deflection and Tim was only able to get a hand to it before it crossed the line. The final score was 1-0 to Tewkesbury Tigers. Looking back this was clearly our best match of the tournament. As soon as the referee blew his whistle to start the game NCC played some superb football dominating the whole game. The defence was solid and Tim hardly even touched the ball. The midfield played some great balls through to Andy and Paul. One particular ball found Paul having a one on one chance against the Trinity goalkeeper but he was unable find the net. The game continued with NCC piling on the pressure and as the game reached the last minute it seemed be only 1 point would be rewarded for our efforts but after some great communication between Mike and Aj the ball was played low from a NCC corner and Aj flicked the ball into the top corner of the goal just before the whistle was blown leaving the final score 1-0 to NCC! It seemed that NCC wanted to continue the pressure they had started in the last game and started dominating again in the last game before the finals were decided. After two quick balls into the Diamonds box Paul and Martin were able to open up their scoring accounts making it 2-0 to NCC in the first 5 minutes! Diamonds were constantly defending and the score could have easily been 5-0. Then confusion set in the last quarter of the match... Aj left the field with cramp and with no subs we were down to 8 and it seemed a child had decided to take up the post of linesman on the NCC defence?! It turned out he was just watching but two potentially off-side goal followed leaving a shocked NCC side looking at a final score of 2-2. With superb performances in every match, NCC were rewarded in a place in the final for the Plate trophy (WAS THAT WHAT IT WAS CALLED?!?!?!) against Trinity and after a superb result against them last time there was every chance of walking away with some silverware! After 80 minutes of football the NCC team were definitely in need of a rest. Trinity dominated the game and with Aj unable to walk let alone run at some points of the game NCC attacks were few and far between. It was down to the rear guard of Andy White, Noel, Lee Collins and Tim Rudge! They dug deep and kept the Trinity attackers at bay with Tim pulling off some saves that would be worthy of Match of the Day! The game ended in a draw and went straight to penalties. Trinity went first and scored, Mike the followed up by scoring for NCC. Then Tim was able to save the next Trinity spot kick and with Martin scoring it was 2-1 to NCC. The next Trinity kick sailed over the cross bar giving NCC a comfortable lead. Paul hit his kick straight at the keeper but even with Trinity scoring Andy was able to calmly place his kick out of reach of the goalkeeper. 3-2 to NCC. Trinity scored again but with one kick left Lee stepped up and fired the ball into the back of the net giving North Cheltenham Churches their first piece of silverware! Special thanks to manager for the day/Linesman Stephen Murton!